I thinned the winter greens a bit today, so I made myself a gourmet lunch. 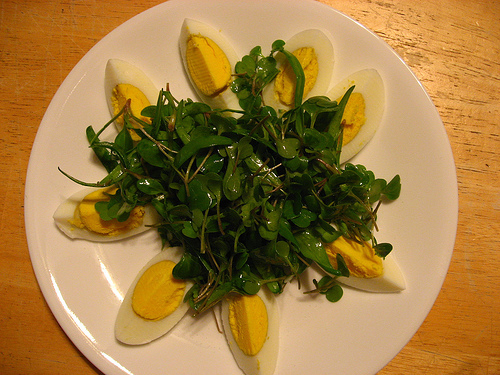 These tiny seedlings are often referred to as "micro greens" at fancy restaurants. Here the combination is arugula and spinach. I tossed the greens with a touch of extra-virgin olive oil and salt. The eggs are from my own chickens (of course). I've been saving a dozen eggs for about 3 weeks now just so I can make some into hard-cooked eggs. I did use the trick of putting a pinhole in the air space (through the round end), too. This combination of techniques worked: I was able to peel the eggs fairly easily. Of course it was incredibly yummy! I still have a lot more thinning to do, so I hope to enjoy more salads like this over the next few weeks. Brrr, it's getting colder! It was 29 F last night, but the baby greens seem to be doing OK under their frost protection row cover. 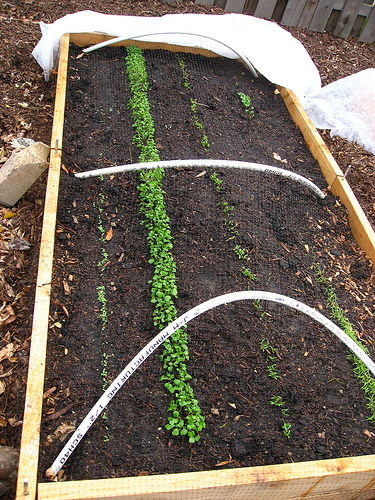 On the left, is the bed the following (L to R): mache (barely visible), arugula, chard, and claytonia. The argula sprouted very fast! 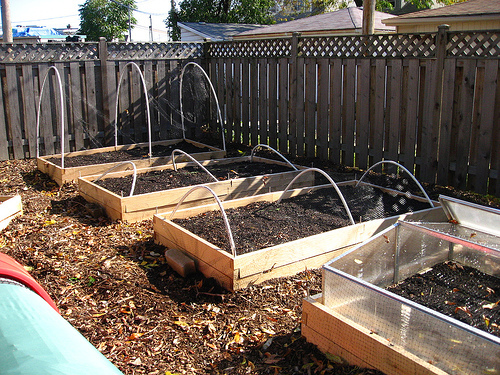 On the right is the bed with the following (L to R): winter lettuce mix, dandelion, mizuna. I neglected to take a photo of the spinach in the cold frame today, but it is already starting to form the first set of true leaves. All need thinning, but I didn't have a chance to do that today. I've thinned the beds only a bit once, but those arugula sprouts are incredibly tasty! I hope to keep these greens going for another month or two. It's likely they won't reach full growth, but I started them rather late. This was an experiment, and I'm happy to see any type of growth on them, frankly! I'd really like to continue eating fresh, locally grown greens over the winter. So, I'm trying to grow them myself. Actually, this isn't a totally personal effort. Rachael came by to help me plant these beds a week ago, and Mark helped me put the beds together a few weeks ago and cut the PVC for the hoops. Planted in the far back is a bed of garlic. This should overwinter just fine with no protection, but I added the hoops and bird netting to keep the chickens off of the bed. They like to dig in the beds, and I don't want them digging up the garlic. 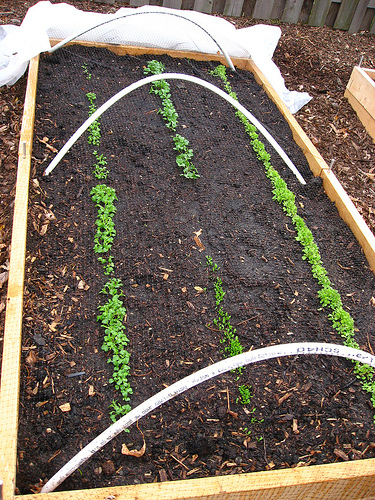 In the next closest bed, Rachael and I planted mache, arugula, chard, and a row of claytonia and radish. Again we added hoops and bird netting to keep the chickens off. The next closest bed we seeded with a winter lettuce mix, italian dandelion, a mixed row of mizuna and radish. More hoops and bird netting, too. Finally, the bed with the cold frame has spinach in it. I added bird netting over that, too. I have some poly row cover for frost protection that I've been putting on during the really cold nights. I plan to keep it on permanently if I have something really growing that needs the protection. All of these greens are supposed to be hardy and should sprout in cool soil. Although we've had unseasonably warm temps, wouldn't you know the temps dropped off right after we planted the beds. I'm pleased to see that we have some sprouting action, though. That's mache sprouting up there. Yay! It appears that the winter lettuce mix is also sprouting, so if I can at least keep these going we'll get a few salads. Mark helped me put the new garden beds in place this weekend. 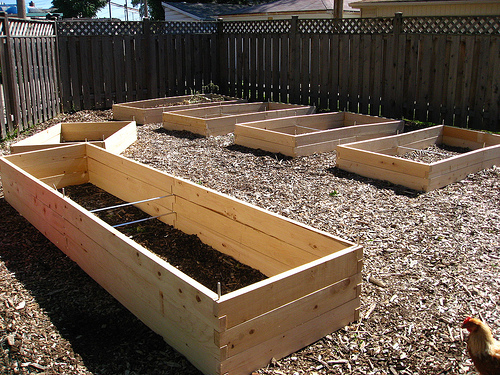 I ordered these beds from Natural Yards and I'm really pleased with them. They went together very easily and seem quite sturdy. Notice that in the corner of the bed in front a pin is sticking up? Those pins are a great feature. They slip into the corners of the beds, holding the boards in place. 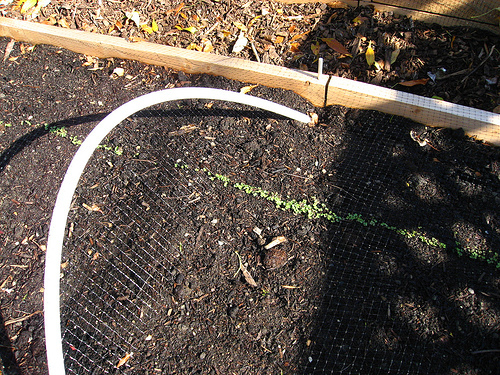 And they will also serve as great anchors for PVC piping that will form the frames for hoops to support fabric for row covers, shade cloth, or bird netting…to keep hungry chickens off the plants. Now all I need is some soil to fill them. In the foreground is the big bed in which I plan to plant 2-3 blueberry bushes. If I add 3 bushes, I'll have to space them slightly closer than is typical, but I'm sure they would be OK. Going clockwise, the next bed will be for asparagus. It's a 4 foot X 6 foot bed, so I should be able fit enough plants to provide asparagus for me and a few friends. The four beds across the back are all 4 foot X 8 foot beds for rotation of various annual veggie crops. I built the one bed around the cinder block bed I had used this year, so it's already pretty full of soil. I'll plant garlic there later next month. The cold frame I picked up through Craig's List will fit in the 4X8 beds very well, so if I can get some soil fill in them soon, I may be able to grow some cool weather greens until the bitter cold starts. Here's another view with the Eglu in position. 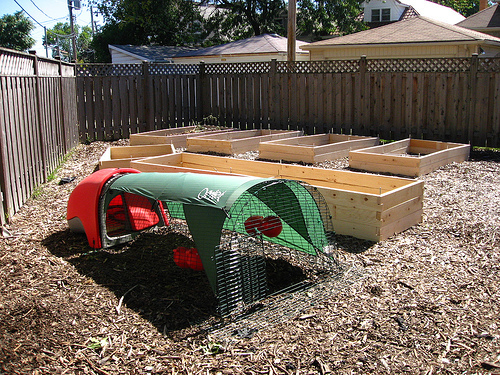 I plan to move the Eglu to the other side of the blueberry bed for winter. By then I should hopefully have the soil and blueberry beds in place, and they could then provide more protection since they'll be on the north side of the Eglu. In the summer, I'll move the Eglu back to this place where the leafed out blueberry shrubs will provide more shade. Although…I also have some grand ideas for a passive solar greenhouse with attached chicken coop for next year, too…I guess I have this whole permaculture vision thing going now. So far, I haven't found any sort of kit that will fit with my vision of a lean-to type greenhouse fitted snugly up against the garage and oriented to catch the most sun on it's south end. I may end up having to design this myself. It seems there's a weather pattern stalled over the Midwest so yesterday was again a grey, rainy day. And, it looks like most of this week will be the same. All this rain is good for the plants, though. As Mark commented yesterday, we typically don't have such a green lawn at this time of year. (I refuse to water turf, since it's such a waste of resources. I just let the grass go dormant in the hot summer, as nature intended. It greens right up in the fall, or in an unusually wet and cool summer.) The new plantings put in by the landscapers a few weeks ago are doing just great, too. But, the rain is not so welcomed by the rest of the household. The dogs don't like getting wet, and usually it is a big pain to get them outside when the weather is like this. I think the only reason they eagerly rush into the back yard is because they are hoping to get near the chickens. This weather isn't the best for the chickens, either. Even with both run covers on, the floor inside the run is wet. Thank goodness the run floor is wood chips or they'd be all muddy. I've always heard/read that chickens need to be kept dry, but I just can't figure out how to do so in this weather. At least their little Eglu coop is dry inside. I actually found some time between showers to check out the inside of the coop yesterday and make a minor adjustment. I peer in there every day through the convenient hatch over the nest box to make sure it is dry, cozy and fairly clean. I've noticed droppings in the nest box, which seems to mean someone is roosting in there at night. Supposedly that's to be discouraged: the nest box is only for laying. So, I cleaned it out and put an upturned flower pot in there. When I went out to close up the coop last night, I heard quite a bit of shuffling going on inside as the girls figured out a new configuration for sleeping. I think it was Maisy who was roosting in the nest box. She's also the more mature of the flock, and therefore the closest to laying. In a week or two I'll take out the flower pot and start putting some soft lining in the nest box for her. The pullets are approximately 17 weeks old when they ship from McMurray Hatchery; in Maisy's case, I think she was at least a week older than the other two. Since these birds can start laying in as little as 20 weeks, I've got to make sure the nest box is ready and they know what it is for. The chooks are definitely learning the routine around here. Last night I ventured out to shut the coop door, hoping that they were already inside. And they were. Of course, with the weather like this, I don't need much prompting to snuggle down inside my house either! All this wet, icky weather means that I am getting a good amount of knitting done, though. I hope to have a finished object to show in the next few days.